Welcome to our official company blog. Here you can find pictures, videos, company news, and animal-control news. If you'd like to search our blog archive by month and year, please click here. If you'd like a complete list of every entry made to this blog since its inception, please click here. I expect the list may become quite long after a while, so you probably should use the search by month function instead. This blog was hand-coded by our Webmaster and is still relatively new. If you have any comments or encounter any bugs, please send us a contact form so we can let him know. 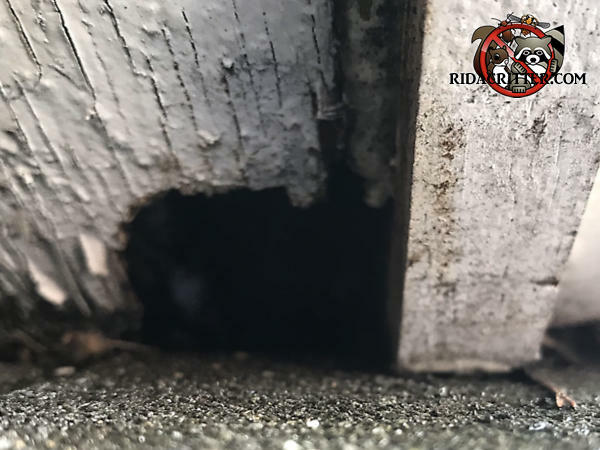 This is a pretty common place for roof rats to gnaw into houses. They probably feel more secure from predators at the roof junction.